DÉCHAUSSÉ -Le Cours du Po, dans le Duché de Mantoue..
DÉCHAUSSÉ, P. PLACIDE A. - Le Cours du Po, dans le Duché de Mantoue.. 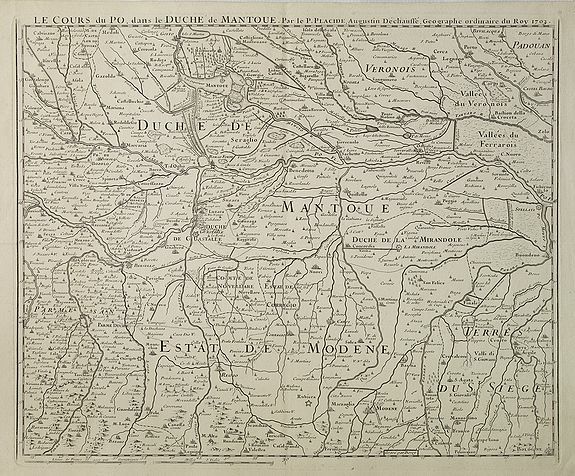 Le Cours du Po, dans le Duché de Mantoue.. - DÉCHAUSSÉ, P. PLACIDE A.
Map maker : DÉCHAUSSÉ, P. PLACIDE A.. Size : 15.9 x 19.5 inches. / 40.5 x 49.5 cm. Description :Detailed map of the area south of Mantua showing the stretch of river which flows from Casalmaggiore as far as the region Veneto. Condition : Good and dark impression on solid paper. Close to very good condition.